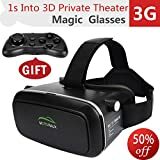 Here comes the interesting 3D MOVIES or GAMING Experience! Innovative Design Comfortable Wearing - Widely Welcomed Gifts Choice! SEPCIFICATIONS: Material- ABS Material Piano Paint Technology & Japan imported aspherical lens distortion Light Weight of 280g for Relaxing Wear Solid & Built to last design, aim to be your funny partners! Effect: The equivalent of five meters away to see 320-inch screen Compatible Models Fits for iPhone, Android phones and Windows phones series within a screen size of 4.0-6inches Note: -Pupil Distance (PD) and Focal Distance (FD) Button need be rotated with Moderate force! -Videos in 3D styles is required to the best effect. -If you need to wear your Myopia glasses, you need to first put your Myopia glass in the headset first and wear the whole sets on head when everything is ready! -If there's any puzzle in operation, please contact us via FAQ & Buyer Message at the first time, we will be active! Innovative Design Comfortable Wearing - Here comes the interesting 3D MOVIES or GAMING Experience! 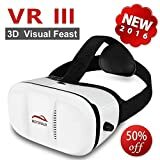 SEPCIFICATIONS: * Innovative Design 3rd Generation Virtual Reality Glasses Widely Welcomed Gifts Choice! * Material: ABS Material Piano Paint Technology & Japan imported aspherical lens * Light Weight of 280g for Relaxing Wear * Built to last Solid design, aim to be your funny partners! * Effect: The equivalent of five meters away to see 320-inch screen Compatible Models Fits for iPhone, Android phones and Windows phones series within a screen size of 4.0-5.9inches Note: -Pupil Distance (PD) and Focal Distance (FD) Button need be rotated with Moderate force. -Videos in 3D styles is required to the best effect. -If you need to wear your Myopia glasses, you need to first put your Myopia glass in the headset first and wear the whole sets on head when everything is ready! -If there's any puzzle in operation, please contact us via FAQ & Buyer Message at the first time, we will be active! 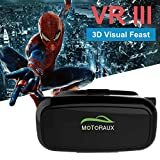 VR Glasses is the most popular Head-mounted Entertainment Devices, which is a super companion for VR Games and Movies. ?Motoraux is characterized by High-grade Optical Lens, Ergonomically Design and Wonderful Immersive Experience, etc. It can be regarded as your private 3D Cinema and bring you great Virtual Reality game experience. INSTRUCTIONS: 1. Download "3D Split Screen" Videos or "VR Games" APPs to your smartphone. [ Notice: No Specified QR Code needed, just download VR APP on Googleplay or the Phone APP store.] 2. Open the front cover plate, place your cell phone in it and close the cover plate. 3. 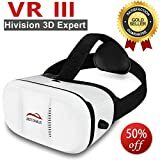 Wearing the VR Headset on head, adjust the suitable tightness of the 3 straps to the most comfortable mode, then you can enjoy your 3D Immersive Experience. 4. If there's phenomenon of fuzziness and double images, please adjust the Pupil Distance and Focal Distance switchs to ensure the viewing pictures are clear and without double images. Note? - Please try to use with large screen smartphones and choose HD videos with good 3D effect to view. - If you need to wear your Myopia glasses, you need to first put your Myopia glass in the headset first and wear the whole sets on head when everything is ready! - If there's any puzzle about our virtual reality glasses in operation, please contact us at the first time, we will be active! This is a portable Bluetooth Remote Controller which can be used as gamepad, media control shutter, which is basic support for iOS & fully support for Android System. Specifications: * Type: Bluetooth 3.0 Compliant * Wireless Distance : 2-10m Operating System : iOS / Android / PC * Battary: Need your Private Owned Type Size alkaline AAA 1.5 V × 2 * Working Time :40 hours Mouse function only for Android Phones How to operate? 1. Firstly, turn your smart phone bluetooth switch on, then press the "Start "button of the RC for 2 Seconds, a red light appeared it will soon turn into flahing light for bluetooth pairing and connecting. 2. Choose KEY Mode / GAME Mode as needed. 3. Built to last sturdy & User-Friendly Model, comes with Illustrated Manual for reference. BUY Now : Get Quality Bluetooth Remote Controller and Considerate Realtime Tracking Service with 30 Days Money Back Experience! Innovative Design Comfortable Wearing - Here comes the interesting 3D MOVIES or GAMING Experience! 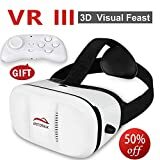 SEPCIFICATIONS: * Innovative Design 3rd Generation Virtual Reality Glasses Widely Welcomed Gifts Choice! * Material: ABS Material Piano Paint Technology & Japan imported aspherical lens * Light Weight of 280g for Relaxing Wear * Built to last Solid design, aim to be your funny partners! * Effect: The equivalent of five meters away to see 320-inch screen Compatible Models Fits for iPhone, Android phones and Windows phones series within a screen size of 4.0-5.9inches Note: -Pupil Distance (PD) and Focal Distance (FD) Button need be rotated with Moderate force. -Videos in 3D styles is required to the best effect. -If you need to wear your Myopia glasses, you need to first put your Myopia glass in the headset first and wear the whole sets on head when everything is ready! -Gift RC can only support the basic actions for iOS System, fully support for Android System. -If there's any puzzle in operation, please contact us via FAQ & Buyer Message at the first time, we will be active! This is a portable Bluetooth Device, together with you when playing game,vedio,selfie... which supporting iOS & Android System and PC smartphones. Easy to connect -When the red light is flashing, turn on the Bluetooth Function on your device -The red light will off when connectionis succeed. In the next time , the device will connect automatically. * Power off Automatically if there's no device / no operation in 60mins after connection. ** How to Reconnect: turn off the the device(power-off condition), hold start button for approx.10 seconds till the red light is flashing. Android MTK mobile controlWhat MTK can do? - Media & shutter control are same with standard Android. It able to support simulation directly but cannot support parts of standard Android APK games. Details: Type: Smart Joystick Wireless: Bluetooth 3.0 Compliant Wireless Distance :10m Operating System : iOS / Android / PC Build-in Battary: LiBattary 3.7V 180mA (Battery Life : About 45 hours Continuously Per Full Charging) Working Current: 0.5-4mA Standby Current: 0.5-1mA Note: Illustrated User Manual in Details for Reference. 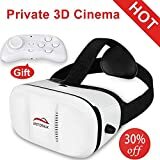 Are you searching for something interesting for 3D MOVIES or GAMING Immersive Effect ? 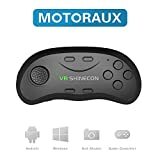 Features: Brand: Motoraux [3rd Generation Virtual Reality Glasses Black Version] Material: ABS material piano paint technology Weight: 280g Compatible with: 4.0-6.0 inch phone Lens: Anti-Japan imported aspherical lens distortion Angle: 80¡ã -95¡ã Fits for iPhone, Android phones and Windows phones with screen size within 6.0 inch, recommended phone size is 4.5- 6 inch. The max length*width of phone is 154mm*82mm. Fits for: Samsung Galaxy Note 4/Galaxy Note 3/ Galaxy S6 Edge/Galaxy S6/iPhone 6s/iPhone 6/iPhone 6 Plus/iPhone 5c/iPhone 5s/iPhone 5/LG G3/SONY Xperia 154mm¡Á82mm. What is in the Package? Glass Wiper * 1 User Manual * 1 3D Virtual Reality Glasses *1 Note: -Pupil Distance (PD) and Focal Distance (FD) Button need be rotated with Moderate force! -Videos in 3D styles is required to the best effect. -If you need to wear your Myopia glasses, you need to first put your Myopia glass in the headset first and wear the whole sets on head when everything is ready! -If there's any puzzle in operation, please contact us at the first time, we will be active!